Rent-All City, family owned and operated since 1960, is the Tampa Bay Area’s premier Party and Special Events rental equipment provider. Whether you’re having an intimate dinner party or a fund raiser for hundreds, Rent-All City has the expertise and the breadth of inventory to ensure the success of your event. Rent-All City has the Bay Area’s most extensive inventory of tents, stages, dance floors, tables, chairs, linen, china, flatware, stemware, serviceware, and much more. Our state of the art showroom and merchandise processing center is located in the Tyrone Area of St. Petersburg and is open to the public Monday through Saturday from 8:00am until 5:30pm. Our friendly, knowledgeable staff will be delighted to assist you in recommending the perfect products for your event, and will assist you in coordinating delivery, installation, and pickup. Allow us to add the "special" to your event! Rent-All City had a rather humble beginning in 1960 working out of a small store front in the 7200 block of Central Avenue in St. Petersburg. The business started out as an all purpose rental store catering to the do-it-yourselfer and the winter visitor. In 1967 as the market rapidly grew, construction began on our previous 12,000 square foot facility. Throughout the 70’s the business steadily grew with the hospitality trade and the company became a landmark in supplying the numerous hotels and motels along the gulf beaches with beds, cribs, tables, chairs, and serviceware for restaurants and caterers. Due to increased commerce, an additional 5,000 square feet of warehouse space was added to the existing facility. In the mid-1980’s the business shifted its primary focus from the do-it-yourselfer to a full service party/wedding/event supplier for individuals as well as businesses. Rent-All City offers a complete line of complementary high quality products such as tables, linens, chairs, serviceware, wedding accessories, dance floors, staging, lighting, concession & cooking equipment, and much more. 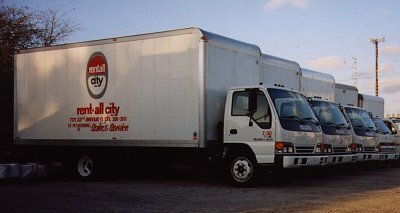 In the winter of 2001 Rent-All City relocated to a new 30,000 square foot facility with state of the art cleaning and processing equipment that will enable us to meet our customers’ demands well into the future. The success of our company has always been based in quality service and our "whatever it takes" philosophy. It is our corporate mission to provide quality products in top notch condition in a timely and courteous manner. We look forward to helping you plan your next party or event in the Tampa Bay area. Please give us a call or come into our showroom in St. Petersburg FL and our friendly staff will be happy to help you!